The SDK is distributed as a Visual Studio Extension but we didn’t submit it to the Visual Studio Gallery just yet (while in beta). You can download it from the Download section of our client area. And you can find instructions on how to implement it into your app on the Documentation page. We hope that we managed to deal with the most common issues during the closed beta, but it’s still a beta, so we encourage you to try it and use it in production, but be sure to test your app thoroughly before submitting it to the Store. And if you do use it in production we will bump up the exchange ratio for your app to 0.85 (normally 0.8) as a symbol of our gratitude. 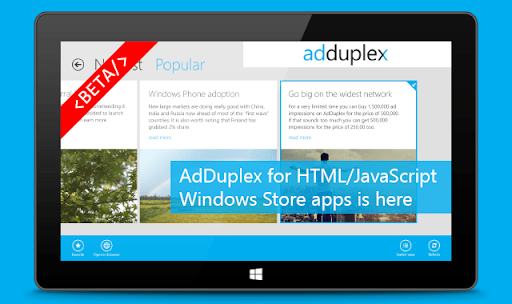 Thank you for using AdDuplex and best of luck with your awesome apps and games!